It is a very practical, easy-to-implement tool for managing projects the way you like to manage them. "My personal productivity and peace of mind have increased. I have been able to dramatically increase accountability"
My constant ‘check, check, double-check’ on my staff is now a ‘single-check’; I can see everything in Priority Matrix, and whether or not it’s been delegated to a team member. Priority Matrix saves principals and project managers at architecture firms hours per week by providing visibility of how work is distributed across their team. When new projects come down the pipeline, managers who use Priority Matrix don’t have to think twice when it comes to deciding who can handle additional tasks. You didn’t become an architect to chase down status updates and re-organize assignments in Excel spreadsheets. Let Priority Matrix take the ‘management’ off your shoulders, so you can focus on bringing ideas to life. It’s Friday (or, whichever day of the week you check in with team members). As your team shares what they’ve been working on, someone mentions they spent the majority of their time last week on something you consider low priority. You’re perplexed and frustrated. After all, didn’t you clearly mention where you needed the team focused last week when you checked in? We’ve all been there, but with Priority Matrix, we find ourselves there a lot less. Priority Matrix keeps your team’s priorities visible, so you have a clear understanding of where your team members are focused, without sending a single email. Project managers can enter tasks into Priority Matrix and delegate to their team, or, architects can add tasks to the system as they work. Whoever is responsible for the task can add due dates, notes, or upload files. Priority Matrix shows you team priorities across the board. Now you know who's busy putting out fires and who's hanging out at the water cooler so you can delegate accordingly. When you use Priority Matrix to track your tasks, we pull together reports for you automatically. We can generate a Gantt chart for you, or show you a list of tasks Jodie from the Design team finished last week. 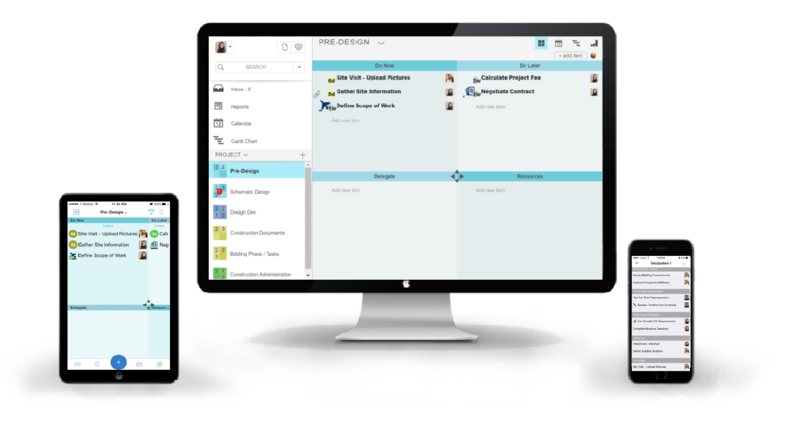 Priority Matrix allows you to share read-only views of your Gantt charts and projects with your clients. Updates happen in real time, so your clients can seamlessly keep up with project timelines and milestones. Try Priority Matrix absolutely free for 30-days. Credit card required. FREE Architecture templates to Subscribers – Unique templates designed specifically for architect firms that you may use ‘as is’, customize or create your own with Priority Matrix. Guaranteed Satisfaction 30-day money back. Priority Matrix is absolutely free to try. While your credit card is required as part of the free trial, it won’t be charged until the 30-day trial is over. Simply cancel the trial at any time by contacting us at support@appfluence.com. For teams larger than 50 individuals, contact us for our enterprise solution. Copyright © 2017 Appfluence. All Rights Reserved.